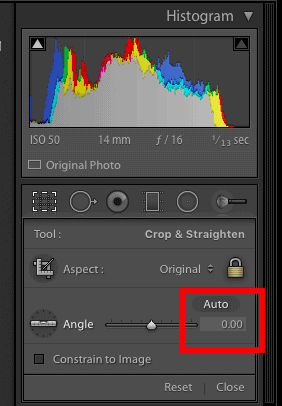 The crop tool has to be one of the most used tools in Lightroom. I would estimate that 99% of the time you process an image it would get used. So with a usage rate that high, it's essential to know the fastest way to use this tool to fly through your cropping and straightening. 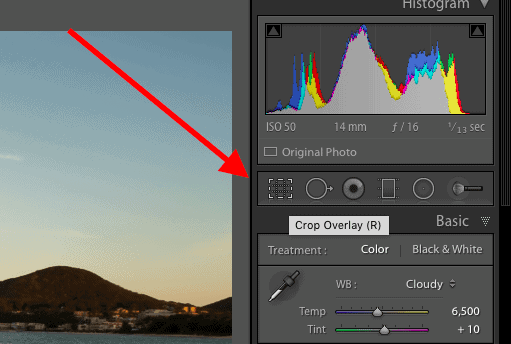 There is no better way to access your Lightroom tools than using a keyboard shortcut. The keyboard shortcut for the crop tool is R, this doesn't make much sense so how I remember this shortcut is by thinking R = rectangle. As you can see in the image below the crop tool is represented by a broken line rectangle, so just remember R = rectangle and you won't go wrong. Straightening the horizon can be a pain especially if you try and use the angle slider, it's just so hard to make minor adjustments with and you tend to just bounce back or forth never really getting the horizon perfectly straight. The angle ruler tool can be a little more accurate than the slider but it still has the same issue once you make the ruler line along the horizon and let go there is no way to make micro adjustments. My favourite way to straighten the horizon is a somewhat hidden feature, but once you know it there's no turning back. To the right of angle slider is a number value and if you hover the mouse cursor over this number you will see it will change to a double arrow. Then all you need to do is click and drag to the left or the right to adjust the horizon. You will find that the control you have using the angle tool is awesome, it's the perfect way to make micro adjustments to get the horizon just perfect. The other benefit is that Lightroom kindly adds a full image grid overlay to line the horizon up with, sweet right! Have you every tried to change the perspective of your crop eg. from landscape orientation to portrait orientation. It can be a real pain you have to grab a corner of the tool and drag it up or down until to pops into the opposite orientation. You normal have mixed success with this method and when it finally changes orientation the crop it's tiny and then has to be adjusted back out, it's a bit of a pain. Get used to using the X key, try it out and you will see that it seamlessly changes the orientation from landscape to portrait with messing around with the corners and having to readjust the crop size.